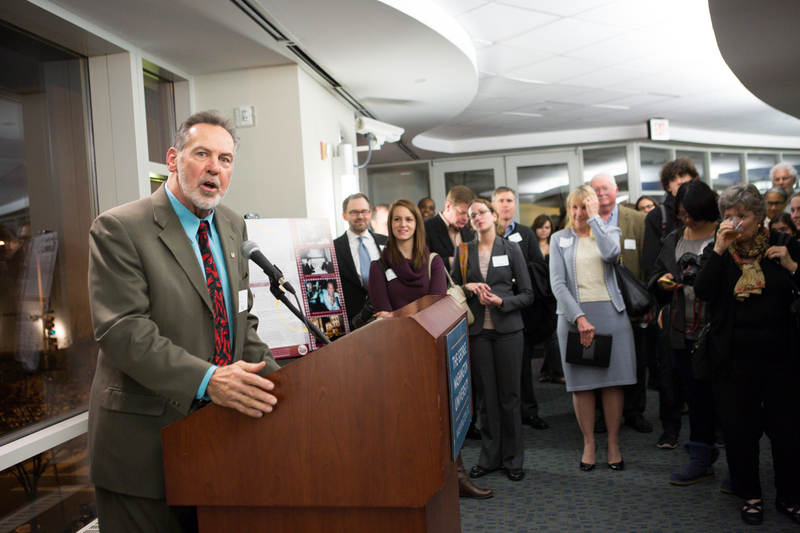 President Steven Knapp, CCAS Dean Ben Vinson III and more celebrate GW’s contributions to D.C. history. 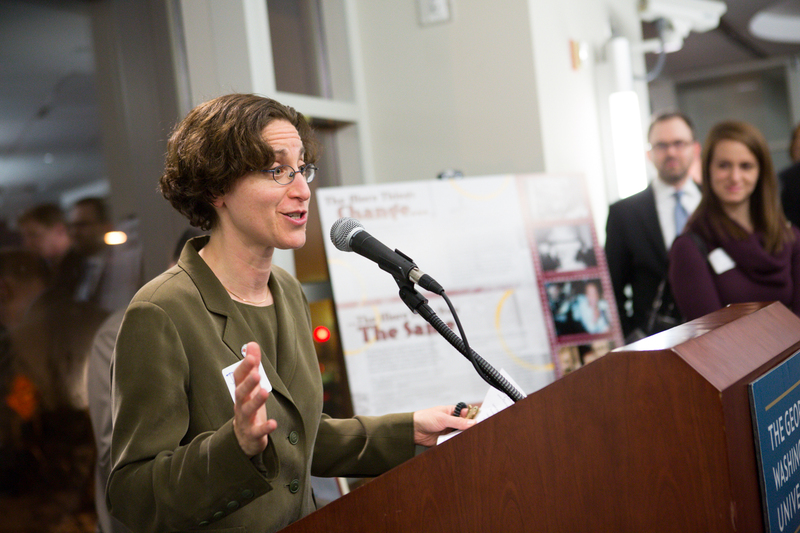 Kate Masur, history professor at Northwestern University, was the keynote speaker at the Letitia Woods Brown lecture on Wednesday. 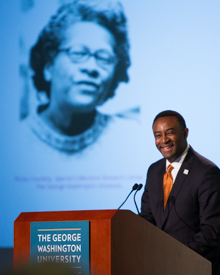 The George Washington University held the annual Letitia Woods Brown lecture and reception on Thursday night at the Jack Morton Auditorium to celebrate the memory of groundbreaking GW professor and scholar Letitia Woods Brown. 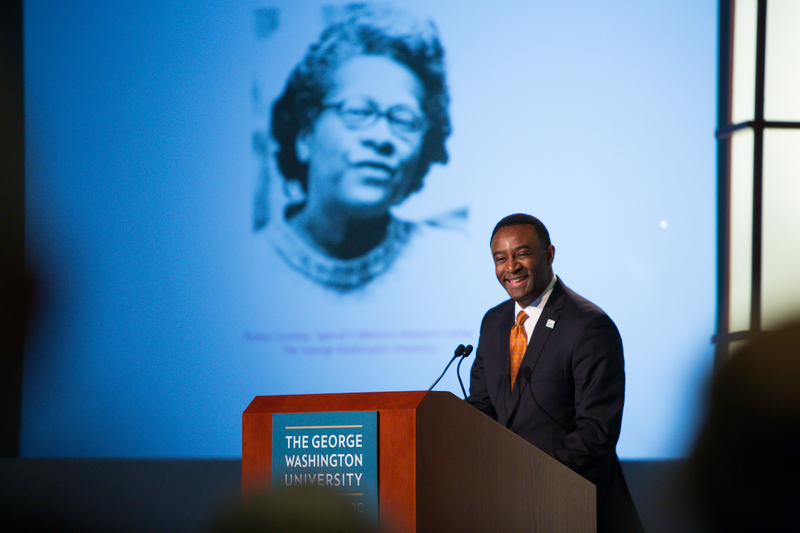 The event served as an opportunity to recognize the continued efforts of the university to promote D.C. historical studies in keeping with Dr. Brown’s legacy. 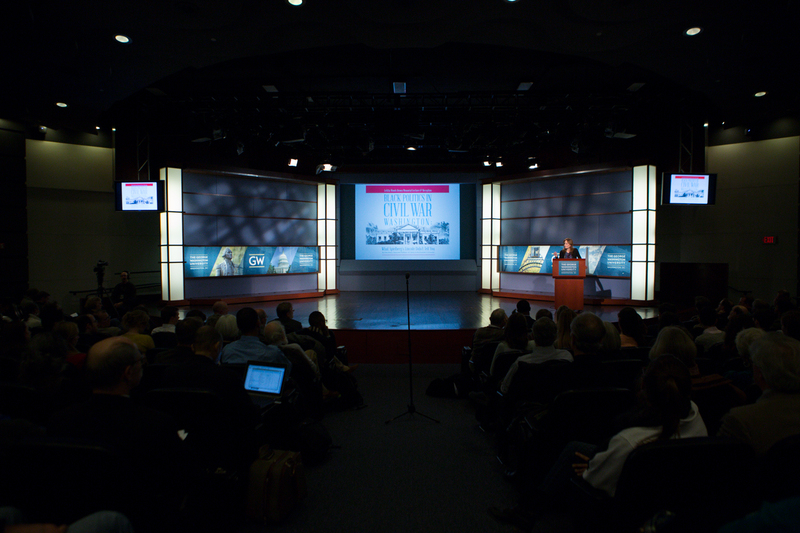 The lecture also served as the kickoff for the D. C. Historical Studies Conference, a city-wide event held from Nov. 14 through 17. 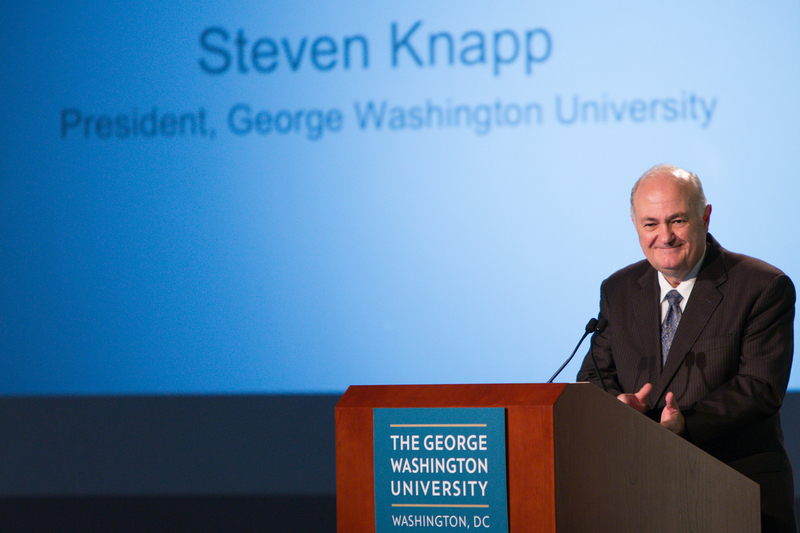 Thursday’s lecture featured opening remarks from President Steven Knapp, Chair of the D.C. Historical Studies Conference committee Matthew Gilmore, Director of heritage and community programs for Cultural Tourism DC Jane Freundel Levey, M.A. '91, and Christopher Klemek, history professor and D.C. Historical Studies Conference committee member. Dean of the Columbian College of Arts and Sciences Ben Vinson III, Director of the new George Washington University Museum and The Textile Museum John Wetenhall and University Librarian Geneva Henry discussed new initiatives the university is spearheading to promote continued scholarship focused on Washington. 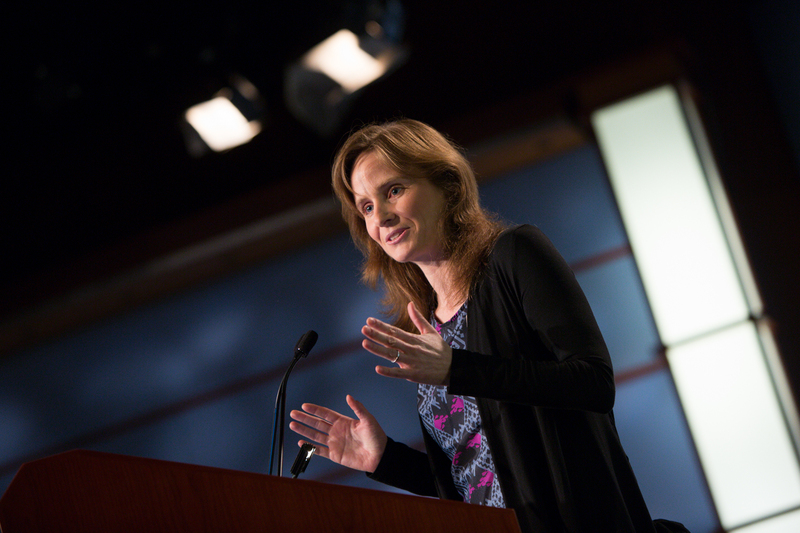 The event’s keynote speaker was Kate Masur, a history professor at Northwestern University. She provided the lecture, “Black Politics in Civil War Washington: What Spielberg’s ‘Lincoln’ Didn’t Tell You,” informed by research she’s conducted on 19th-century Washington. "The values of citizenship and leadership embodied in Dr. Brown are very much a part of the university envisioned by our namesake more than 200 years ago," Dr. Knapp said. Dr. Knapp called Dr. Brown a “tireless advocate for the preservation of the city’s heritage." Dr. Klemek introduced Dr. Wetenhall, Dr. Vinson and Ms. Henry to discuss university initiatives that exemplify a commitment to D.C. historical studies. Dr. Wetenhall shared the importance of the Albert H. Small Washingtoniana Collection, a gift to the university that includes hundreds of rare papers, maps, drawings and other artifacts that illustrate the history of the nation’s capital. Dr. Wetenhall invited the audience to view the collection once it is permanently housed in the historic Woodhull House when the new museum opens in 2014. In addition to Mr. Small’s Washingtoniana collection, Ms. Henry added, the Estelle and Melvin Gelman Library’s Special Collections Research Center is home to an extensive collection of documents, maps and photographs that document the history of Washington. She also shared a new project, DigitalDC, which will bring undergraduates and high school students together to compile D.C. historical research online. Dr. Vinson shed light on Dr. Brown’s career and contributions to the community. Dr. French attended the lecture, along with members of Dr. Brown's family. 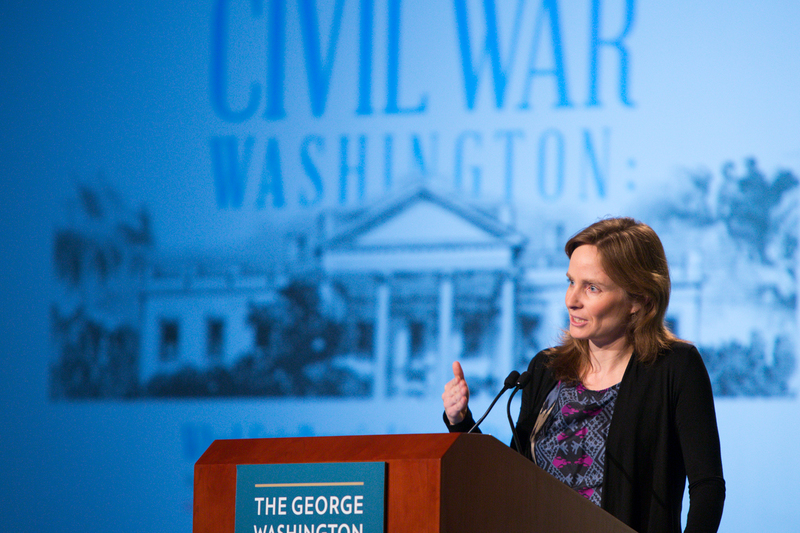 Dr. Masur shared the research she’s done on D.C.’s history, which examines how Americans came to grips with the end of slavery during and after the Civil War. The capital is not as widely studied as cities like New York and Chicago, but Dr. Masur was able to dig up resources like city proceedings and historic newspapers to understand Civil War-era Washington. Dr. Masur analyzed director Steven Spielberg’s depiction of Washington in his Oscar-nominated film “Lincoln.” She felt there was a limited focus on both depictions of the city and on African Americans in the film. After her lecture, she engaged in a brief question-and-answer session with the audience. Dr. Klemek said the lecture gave the city and the university a chance to come together and learn more about Washington’s history. 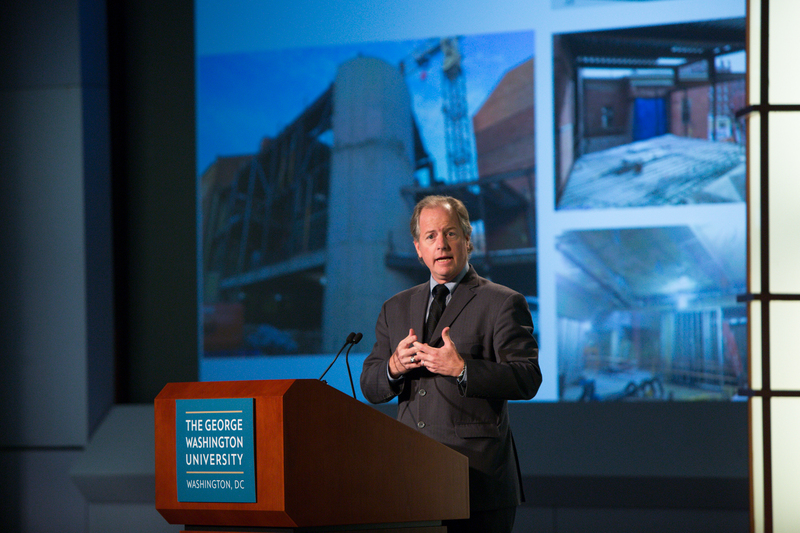 “The evening's events really brought together a diverse cross section of the community: In addition to GW undergraduates, graduate students and faculty, there were D.C. high schoolers, professionals from citywide cultural institutions, as well as a broad general public of history enthusiasts,” Dr. Klemek said. He also highlighted the event’s opening reception, which was catered by Ben’s Chili Bowl, organized with the help of Assistant Vice President for District Relations Bernard Demczuk. Dr. Demczuk has been called the restaurant's "unofficial historian." The iconic U Street eatery donated historic papers and artifacts to the Estelle and Melvin Gelman Library in 2011. 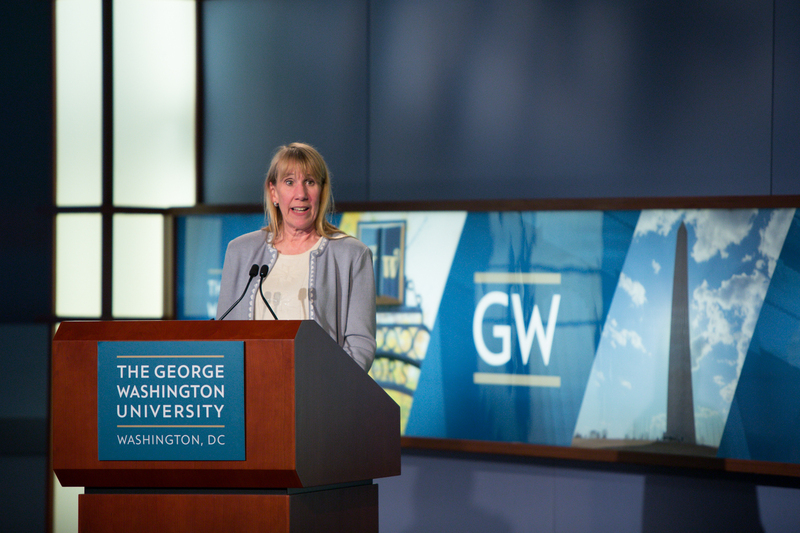 Jennifer King, interim director of special collections at GW Libraries, speaks at the reception. Assistant Vice President for District Relations Bernard Demczuk speaks at the reception. 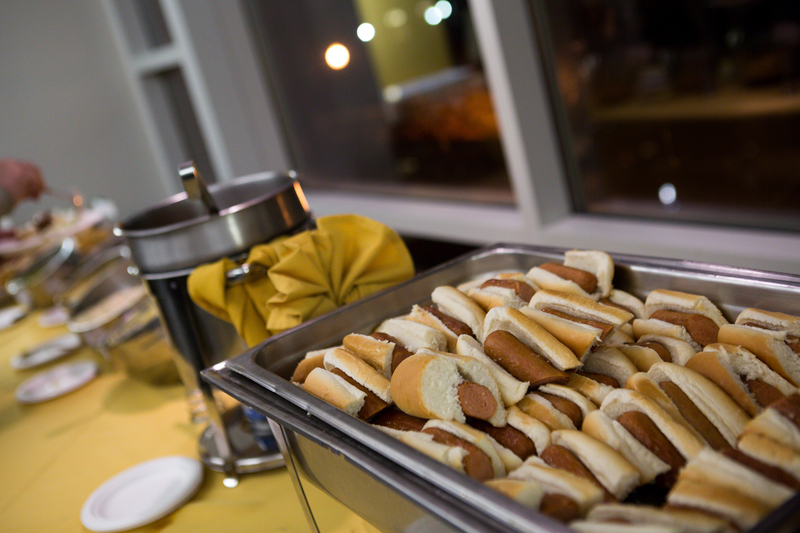 The reception was catered by Ben’s Chili Bowl. 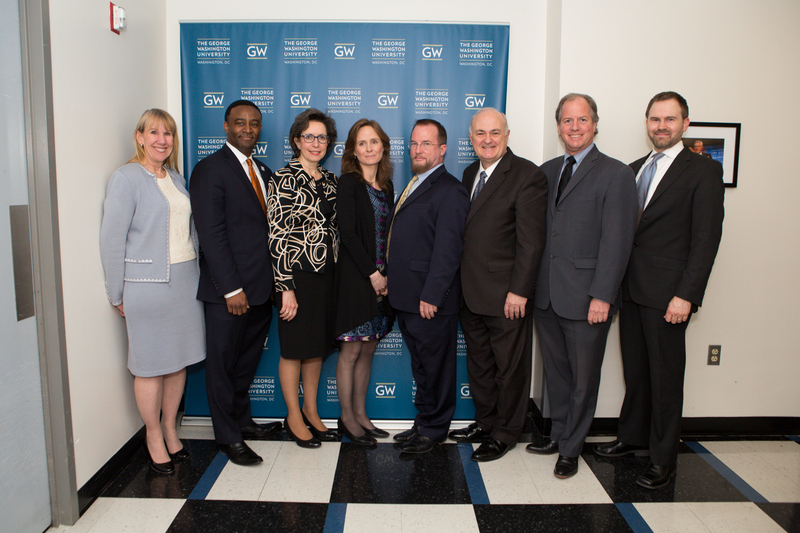 Left to right: Geneva Henry, Ben Vinson III, Jane Freundel Levey, Kate Masur, Matthew Gilmore, President Steven Knapp, John Wetenhall and Christopher Klemek. 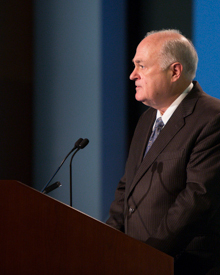 President Knapp opens the lecture. 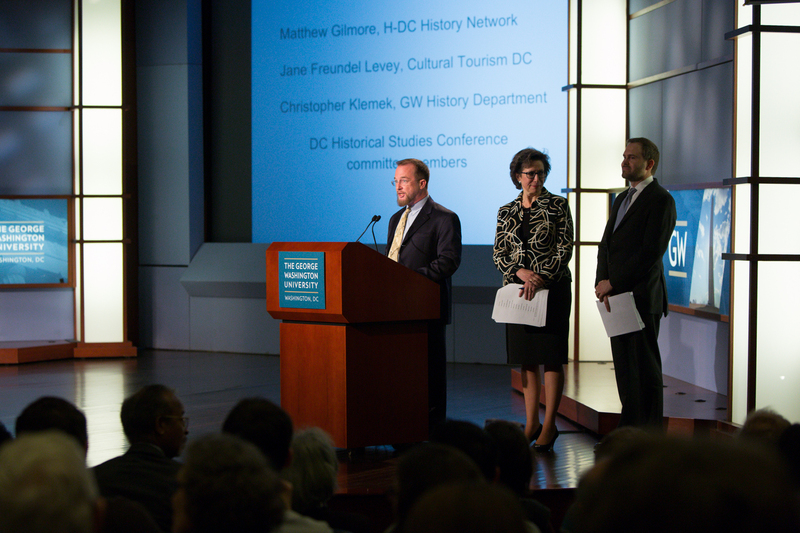 Matthew Gilmore, Jane Freundel Levey and Christopher Klemek make remarks during the program. 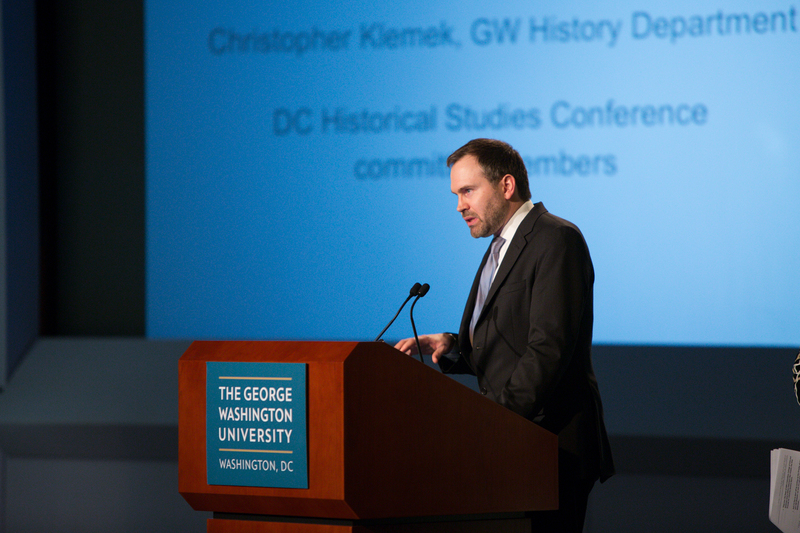 Christopher Klemek discusses GW efforts to promote D.C. historical studies. John Wetenhall shares thoughts on the historic Washingtoniana collection donated by Albert H. Small. 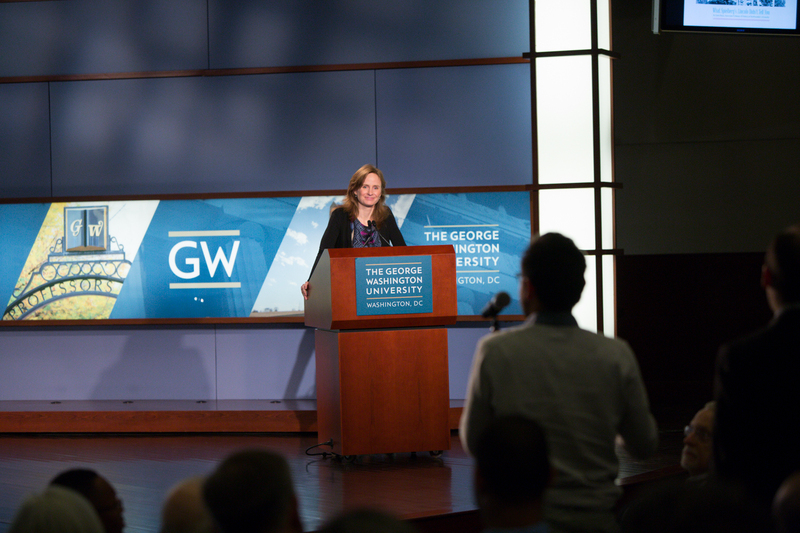 Geneva Henry makes remarks on resources for researching and teaching D.C. history at GW. Ben Vinson III discusses the legacy of Letitia Woods Brown.